James J. Tissot, 'My Soul is Exceedingly Sorrowful unto Death' (1884-96), gouache on board, Brooklyn Museum, New York. Sometimes I wonder why the Garden of Gethsemane is included in the Gospels. Frankly, it's easy to misunderstand. Jesus is struggling, sweating profusely, so torn up inside, so exposed, so human. At first glance, Jesus seems weak, actually asking the Father to help him back out of the plan forged in heaven before the beginning of time. Is he afraid to die? Many brave men and women have faced death, even difficult deaths. Is he weaker than they? The answer, I believe, can be discovered in Jesus' own words. "For many." The phrase seems strange until you realize that Jesus is recalling those same words found twice in Isaiah 53, the chapter that prophesies Jesus' death for our sins. These sayings teach us that, as Jesus looked forward to his own death, he understood it a ransom, that is, a payment to set others free. He also saw his death as bearing the sins of many -- our sins. Sin isn't pretty -- or petty. Oh, our world dresses it up as cleverness, as happiness, as fulfillment. But despite its many deceitful faces, sin at its root is about asserting power. It is rebellion against God's authority, an undermining of his Kingdom. Sin is turning up our nose at God and doing what we want in spite of what he says -- and there's nothing pretty about that. Occasionally, when I sin, God gives me eyes to see how desperate, how corrupt, how utterly bankrupt I am in my sin. Like a painted, worn-out prostitute trying to look pretty, but failing miserably. Jesus' mission, should he chose to accept it, was to bear my ugly sins. And then yours. And then multiply that by billions and billions -- "the sin of many." But to carry out that mission, he would be forever stained. Have you ever tried to wash the smell out of a plastic garbage pail? Try as you will, the stink still lingers. And for Jesus to bear our stink, our sins, would demand a break with his Holy Father. From before the beginning, the Son and the Father have enjoyed each other's presence. Have basked in fellowship and unity and love. But the cross utterly shatters that fellowship, because God's holiness cannot cohabitate with sin. 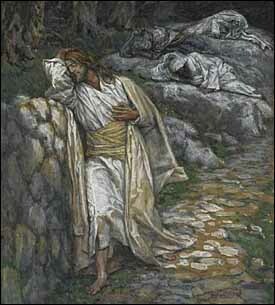 I think it's that specter that disturbs Jesus so deeply in Gethsemane -- loss of his Father, even if for a short time. And revulsion at what sin will do to him, he who has never had it stain his life before. He faces our multiplied sins, heaped up upon him to no end. So Jesus pleads in the Garden, "Father, is there no other way?" He cries out, he searches, he asks in a bold intimacy. And then he surrenders afresh: "Not my will, but yours. "4 Not my desire to avoid desolation, and sin, and corruption, but your difficult and only way to save the people we both love. Jesus models for us disciples what it means to follow, to obey even when we don't fully understand. recalling the beginning words of Psalm 22, an amazing psalm that prefigures many of the events of the cross. Jesus' final words from the cross, however, are words of hope. The sixth word is: "It is finished. "7 We have done it, Father, at huge cost to both you and me. It is finished. The ransom is paid, the stain of sin is borne away from the people we love. It is finished. His seventh and last word also looks forward in hope, in faith: "Father, into your hands I commit my spirit. "8 The Father's hands are strong enough to hold both him and us, even in our most devastating moments, even when we don't feel his presence at all. Saturday is quiet; it is Sabbath in Jerusalem. But Sunday morning, all heaven breaks loose, and the Son of God steps out of the grave. His body that has born our sin is recognizable by the scars, but the stench of sin and death are gone. He is risen! Hallelujah! And his resurrection is our confidence that God has both accepted his sacrifice for sin, and flooded us with his healing, life-giving power. Hallelujah! My dear friend, you may be feeling loneliness and brokenness, as if there is no way back for you. But I have good news. Long before you ever needed a Savior, your Father so loved you -- and "the world" and "the many" -- so that he sent his own Son to bear your sins, so that you no longer have to bear them. He was laid in the tomb bearing your sins. But on Easter Sunday his body was changed and set free and victorious. And so are you, when place yourself in his hands. That is grace -- God's unmerited favor for us who are so loved by him. That is the message of Gethsemane and Golgotha and the Empty Tomb. Hallelujah! He is risen!